Ain't gettin' my leaves, betch. And, as the little giraffe's body decomposed, the others continued to nonchalantly chew on their leaves. F: Giraffes rot in less than 10 seconds after they die. Short Giraffes decompose abnormally fast? The corpse decomposed?! DAAAANG those giraffes have been eating for a long time!!! The little giraffe showed such an expertise in playing dead that he convinced himself. "Our extra large statue giraffes and trees look identical to their living counterparts but have the advantage of easily outlasting any real giraffes." None of the answers are correct! Giraffes don't reach up to eat - they generally bend their necks to eat. The large neck is a sexual selection and fighting adaption. 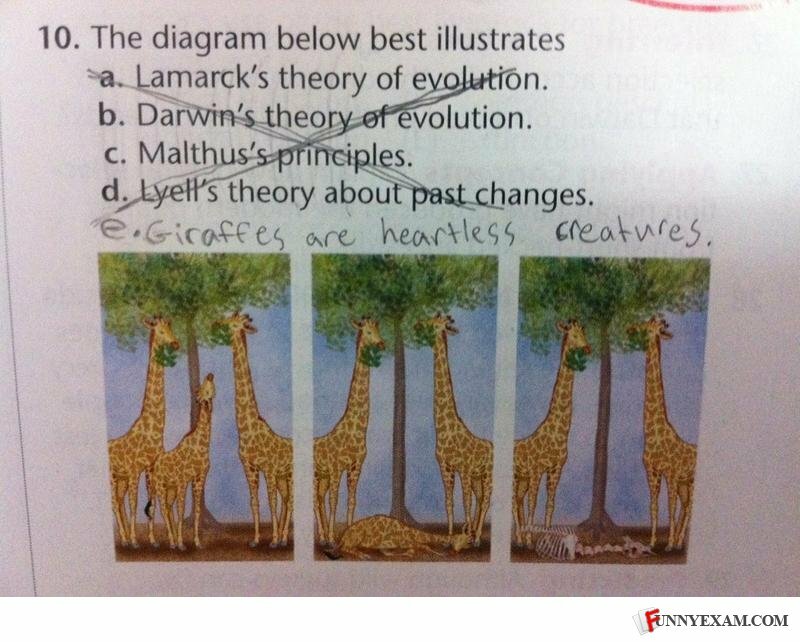 Exam writer fail! I will eat all the leaves on this tree, I will eat more leaves than I should, and then other giraffes may die. I am an evil herbivore. This proves that if you are a midget and can't reach the top shelf that you die. Not a single **** was given that day. I find it awesome that neither of the other two giraffes move at all. This is my tree there are many like it but this one is mine. Without me my leaves are useless, without my leaves I am useless! What if they knew that the giraffe only ate meat? f. Everyone likes some meat to go with their veggies. F: Giraffe never change facial expressions. You probably thought those were real giraffes. Nope, just Chuck Testa. Man will pay for all his misdeeds... when the treetops are stripped of their leaves... Whoah-oooh.